Munich - FC Bayern München’s current record-breakers probably don’t cast their minds back to who the 1. FC Köln coach in the early 1980s was very often, but perhaps they should, as the Reds have a lot to thank him for. Rinus Michels, the godfather of ‘total football’ may only have been able to add the DFB Cup to his trophy collection between 1980 and 1983, but his effect on Pep Guardiola and his own countrymen is leaving its mark on the Bundesliga today. Michels, voted FIFA’s Coach of the 20th century, also had a stint at Bayer 04 Leverkusen in 1988/89 and his lineage in Dutch football is leaving an indelible imprint in Germany, from Guardiola’s refinement of ‘total football’ at Bayern to the spate of Dutchmen in charge at Bundesliga clubs. Gertjan Verbeek was recently appointed the new coach at 1. FC Nürnberg and Bert van Marwijk is at the helm at Hamburger SV, joining Hertha Berlin's Jos Luhukay to make it three Dutchmen in charge of Bundesliga clubs. Indeed, turning to their Dutch neighbours has long been a rewarding option: in recent years, Huub Stevens and Louis van Gaal have been two of the most successful imports at FC Schalke 04 and Bayern respectively. Stevens won Schalke’s only continental title, the UEFA Cup in 1997, as well as the DFB Cup in consecutive seasons after the turn of the century, while Van Gaal received the Manager of the Year in 2010 after guiding Bayern to the Bundesliga and DFB Cup double in 2009/10, becoming the only non-German to be honoured with the prize. Both he and Stevens cut their teeth on the Dutch domestic scene, Stevens with PSV Eindhoven and van Gaal with AFC Ajax, before the latter laid the foundations for Guardiola at both FC Barcelona and Bayern. 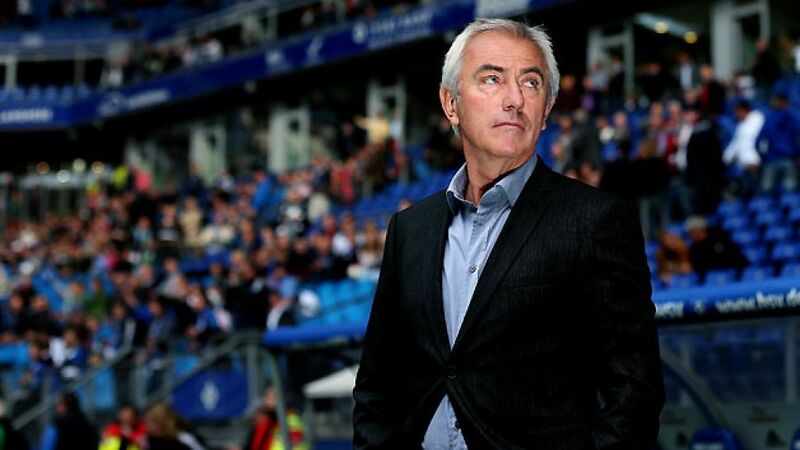 Hamburg have had mixed successes since van Marwijk’s appointment, but his commitment to youth cannot be faulted. Jonathan Tah and Lasse Sobiech have been given their chance in defence, while Hakan Calhanoglu and Pierre-Michel Lasogga have shone under his leadership going forward. The other Dutchman currently occupying a Bundesliga hotseat is flying considerably higher in the league standings. Luhukay took FC Augsburg to the Bundesliga for the first time in 2011, brought Hertha back into the top flight in 2013, and has masterminded the capital club's ascent up to seventh place after twelve games in the 2013/14 campaign. His brand of attacking football has thrilled fans across Germany and adheres to the Netherlands' footballing principles as laid out by Michels. What the future holds for the Dutchmen charged with reviving the fortunes of three of the Bundesliga’s most traditional clubs is unclear, but one thing is for sure: they have brought their own version of the Netherland's inimitable footballing style, pioneered by Michels all those years ago. On the international stage, Germany and the Netherlands may be fierce rivals, with Germany beating their neighbours in the 1974 FIFA World Cup final and Holland prevailing in the semi-finals of the 1988 UEFA European Championships. However, the Bundesliga has become a stage where the Dutch footballing ideology has thrived, and with disciples of the calibre of Guardiola, van Marwijk, Verbeek and Luhukay, that trend looks like continuing.